I don’t think you could get anymore fruit in this Blueberry Nectarine Buckle, and I’ve made it twice – once with a combo of nectarines and blueberries and the other an all blueberry number. Both were delish, and the original recipe states any juicy fruit can be substituted. Update: Feedback has shown that if fruit is too juicy the cake will not bake up properly. I’ve updated the notes on the actual recipe. Wikipedia says a buckle is a variation of a cobbler, that the buckle is “… made with yellow batter (like cake batter), with the filling mixed in with the batter)…if memory serves, the name buckle came about because the amount of fruit causes the batter to “buckle” or collapse a bit. 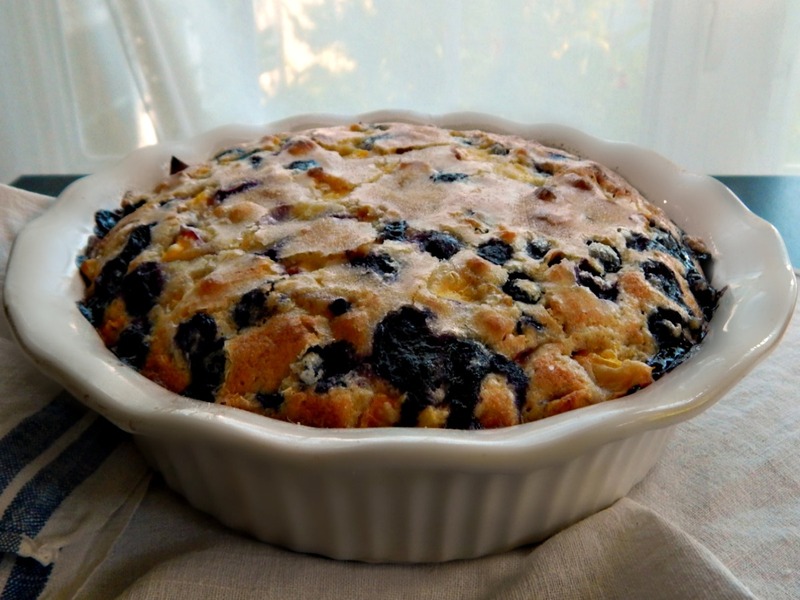 Blueberry Nectarine Buckle – you’d be hard pressed to get any more fruit in this humble dessert! I want to note that a reviewer of the original recipe alerted me to a possible error, so I made the correction in my recipe, below. Yep, I read all 204 reviews (so you don’t have to…) Summer fruit seems to go on a rotation for sales so when you buy fruit, let the pricing be your guide. And watch for the deepest cuts right before the Summer Holidays. Those wily grocers are competing to get you in the door! It seems that if the fruit is too juicy, it can cause the cake to be too moist. I would stick with berries, or if using other fruits, use them at the just ripe stage and toss the fruit in a few tablespoons of flour, first. Recipe slightly adapted from the New York Times. This entry was posted in Click here for Fabulous Food Posts and tagged Blueberries, Cake, Desserts, Frugal Hausfrau, Fruit Desserts, Nectarines, new york times. Bookmark the permalink. Lovely indeed. We don’t see the quality of blueberries you get. I’m jealous of both quality and quantity now. We love blueberry desserts and all the better that it’s rustic. That means less pressure to get it to look perfect. It looks delicious just the way it is and I know just the friend to make it for! I’m loving these simple little cakes more and more all the time! Well, now I know what to do with our blackberries once they’re ripe! Thanks for sharing! Hi – I just chopped them up. The skins seemed just fine in it. And it’s my pleasure! Oh yumm! This looks so good! Omnomnom 🙂 Happy Fiesta! Thanks much! I’m going to miss summer and all the wonderful fruit! I love the name of this! Yes, blueberries are quite abundant this year! I like the name, too! I think I’m going to make a “slump” or a “grunt” next, lol! I love baking with kids! Hope you have a blast!! Thanks much – this was a real hit. Hard to go wrong with blueberries! I love that it’s just bursting with all those blueberries. Great job! Oh no, that’s just a shame…I feel so bad. I’ve only made it with the blueberries (which really aren’t that juicy) and half blueberry/nectarine. I think I better note that in the recipe, though! Now that I think of it, we haven’t had pie in forever, either. And summer pies are just the best! I was going to buy peaches (they were both on sale) but last year they were a great disappointment, soft and flavourless. This year’s didn’t inspire either. They’re in sealed clamshells so you can’t handle and sniff. I understand why they sell them that way but you come in for a big disappointment sometimes. So I bought the nectarines. They were sealed in the package and I couldn’t pick them up and sniff them etc so I passed them by … even though they were relatively cheap. Wow, Mollie. You’ve really outdone yourself. I adore blueberries and are counting the days now until they’re back in season. I did see some fresh berries in the supermarket the other day but they were the price of a small country. Hmm, think I’ll wait. I’m imagining this buckle (cool name!) with a big dollop of creme fraiche. Yum. Oh my that looks good!! I get confused with buckles, cobblers, crisps pan dowdy’s a buckle is more like a cake it seems. Those blueberries are the star of the show and look so juicy and delicious!! That would be a blast – maybe a big link up? It would be so much fun!! We should get Angie on it, lol! !